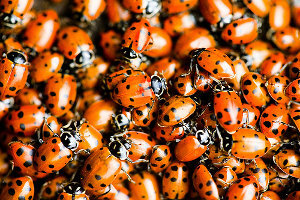 3,000 ladybugs ( two packages ) should be adequate to remove most of the aphids in an average yard (1/4 acre) if you disperse at night and shower the ladybugs in a light spray from a garden hose. Aphids can fly and may reappear, so a second application of ladybugs may be necessary. There are over 175 species of ladybugs in California. Many of these species feed on aphids, mealybugs, and spider mites. One of the most common is the Hippodamia Convergens Guerin. The Adult is about 1/4 inch long, usually has 13 black spots on the redish orange wing covers. Additionally it has two converging pale strips on the thorax. Yellow eggs are laid on end in clusters of 10 to 50. The alligator shaped larva then hatches, eating whatever aphids are left after the adults have left or have not gotten to. After the larva matures and and completes its feeding, it pupates, usually on upper leaf surfaces. Under normal California summer conditions, the life cycle of the of the lady bug is about 3 to 4 weeks. During cooler spring months, 6 weeks for the completion of the life cycle is typical.